Juventus host Man Utd in the Champions League on Wednesday night, and they could be short of options in attack due to injury problems. The Turin giants were deserved winners in the reverse fixture at Old Trafford last month, showing that they’re arguably a class above Jose Mourinho’s men currently. Paulo Dybala’s goal separated the two sides on that occasion, and in order to take a big step towards qualifying for the knockout stages in top spot in Group H, they’ll be hoping to produce a repeat performance in Turin this week. 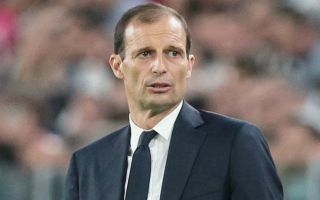 However, as noted by Sky Sport Italia journalist Gianluca Di Marzio, coach Massimiliano Allegri is expected to be without attacking duo Douglas Costa and Federico Bernardeschi after both were absent from their training session on Tuesday. In turn, that will likely place the responsibility of scoring goals on the shoulders of Dybala and Cristiano Ronaldo, with both starting the season in fine form and so they seem more than capable of ensuring that Juventus don’t miss their injured attackers. Meanwhile, there was also positive news for Allegri, as it’s added in the report that Joao Cancelo and Blaise Matuidi joined up with the rest of the group as they recover from their own respective injury problems. Coupled with Mario Mandzukic also being present, that will be three key individuals expected to be available for the Serie A champions for the crunch clash with the Red Devils. Juve currently sit top of Group H with a 100% record, with United in second place with four points while Valencia are just two points behind them as they look set to battle for second spot. However, a win over Juventus on Wednesday could certainly change the complexion of the group table.